WAR CHANT (USA) (Bay or Brown 1997-Stud 2001). 5 wins-1 at 2, Breeders' Cup Mile, Gr.1. Sire of 634 rnrs, 431 wnrs, 36 SW, inc. Kingsfort (Curragh National S., Gr.1), Midnight Interlude, Chamberlain Bridge, Brilliant, Variation, Carlos Gardel, War Kill, Time Chant, Silent Sedition, Karen's Caper, Sea Chanter, Chattahoochee War, El Roblar, Chantski, Norman Invader, Asperity, Ballymore Lady, Doncaster Rover, Cease, El Facha, Tarooq, etc. War Jeune (g. by War Chant). 2 wins. See below. Bella's Keeper (f. by Scandal Keeper). Placed at 3 in 2016-17 in Aust. Bonfires (Kaapstad). 4 wins-1 at 2-at 1200m, 1400m, A$128,038, AJC Kensington Flying Welter H., Heckenberg Welter H., STC Petersham 2YO H., Wetherill Park H., 2d MVRC Bill Stutt S., Gr.2, 3d VATC JD MacDonald S., L, AJC Edinburgh Flying Welter H., RW Furber Flying Welter H., STC Yaralla H.
GREY SONG (Unbridled's Song). 6 wins-2 at 2-from 1400m to 2800m, A$1,951,500, AJC Chairman's H., Gr.2, VRC Blamey S., Gr.2, St Leger, Gr.3, AJS Window Cleaning 2YO H., MRC 100's & 1000's Club H., VATC Harrie Smith 2YO H., 2d MRC Underwood S., Gr.1, Caulfield Cup, Gr.1, Herbert Power S., Gr.2, Sandown Classic, Gr.2, VATC Norman Robinson S., Gr.2, MRC WJ Adams S., L, 3d AJC Sydney Cup, Gr.1, MRC Caulfield Cup, Gr.1, Sandown Classic, Gr.2, QTC PJ O'Shea S., Gr.2, VRC Queen Elizabeth S., Gr.3. TONZ MORE FUN (More Than Ready). 5 wins-4 at 2-to 1200m, A$151,375, SAJC Jansz S., Gr.3, MRC Stargazer 2YO H., 2d MRC Holmesglen 2YO H., Kilshery H., Waranton H., 3d MRC Zephyr Bay H., MVRC Frank Bullock H., Inglis H.
Fairessa (Encosta de Lago). 3 wins at 1600m, A$164,300, MVRC Frank Gibson H., MRC Lady Sybil H., 2d SAJC Penny Edition S., L, City of Adelaide S., L, MRC Le Pine Funeral Services P., Silvan Australia H., Copperama H., MVRC Champions Australian Racing Museum H., 3d SAJC Marsh Classic S., Gr.2, Stuart Crystal Laelia S., L. Producer. EL NINO (Jeune). 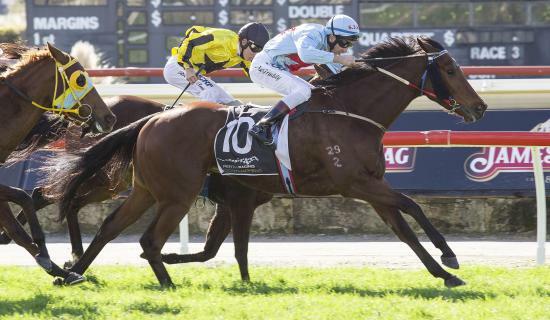 9 wins-1 at 2-to 1400m, NZ$3,250, A$453,430, Mornington RC Hareeba S., L, MRC May Sprint H., Australian Bridal Service H., Back to Caulfied Raceday Welter H., Pink Ribbon Cup, VRC Via Veneto Ristorante Welter H., MRC May Sprint H., MVRC Candy H., 2d MRC Moonga S., Gr.3, SAJC John D Lee S., L, 3d VRC Paris Lane S., L.
Fearless Gun (Bite the Bullet). 7 wins from 1450m to 2000m, R619,225, 2d Vaal Emerald Cup, Gr.2, 3d Vaal Family Fun Today H.
Pull No Punches (Elvstroem). 7 wins-1 at 2-from 1250m to 1600m, A$237,527, SAJC Australia Day Races H., Boag's Draught H., AFL Grand Final H., Desiree Gill Memorial H., 2d SAJC Sportingbet H.-twice, MRC (Mornington) Orbit Fitness H., 3d SAJC Christmas H., L, MVRC Inglis Melbourne Premier Sale 2YO P., MRC Art Series Hotel Group H., SAJC Paul's Milk H.
Unequivocal (Not a Single Doubt). 3 wins-1 at 2-at 1200m, 1400m, A$294,170, to 2015-16, Illawarra TC Bede Murray Provincial Championships Qualifier, ATC Membership on Sale Now H., 2d BRC Just Now H., L, Hawkesbury RC Ladies Day Cup, L, ATC #Theraces H., 3d ATC Inglis 2YO Classic, L, 4th BRC Just Now H., L.
Race Record: 4 Starts 2-0-1 A$83,900. 2 wins at 1000m, 1250m, A$83,900, in 2015-16, WATC Raceday Hospitality H., 3d WATC Jockey Celebrations Day H.